Brewer Description: (from bottle) When we got our hands on brand new Nadalie Foeders, we wanted to utilize their fresh oak character by taking advantage of the natural tannins in the French Oak. 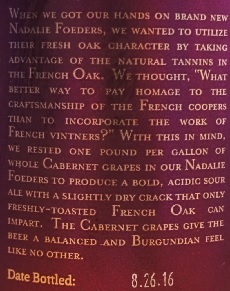 We thought, “What better way to pay homage to the craftsmanship of the French coopers than to incorporate the work of French vintners?” With this in mind, we rested one pound per gallon of whole Cabernet grapes in our Nadalie Foeders to produce a bold, acidic sour ale with a slightly dry crack that only freshly toasted French Oak can impart. The Cabernet grapes give the beer a balanced and Burgundian feel like no other. Intro: A 500ml bottle, batch # 1129, bottled on 26th August 2016. Poured into a 3 Fonteinen stemmed glass. Appearance: A cloudy murky brown colour with a very slight red tint, and a one finger light tanned head that dissipated quickly and left only sparse to no lacing. Aroma: Tart, berries, cherry, grape, oak, vanilla, funk and lemon. Taste: Tart, sour, vinous, mixed berries, lemon, with a hint of red wine, light oak and vanilla. 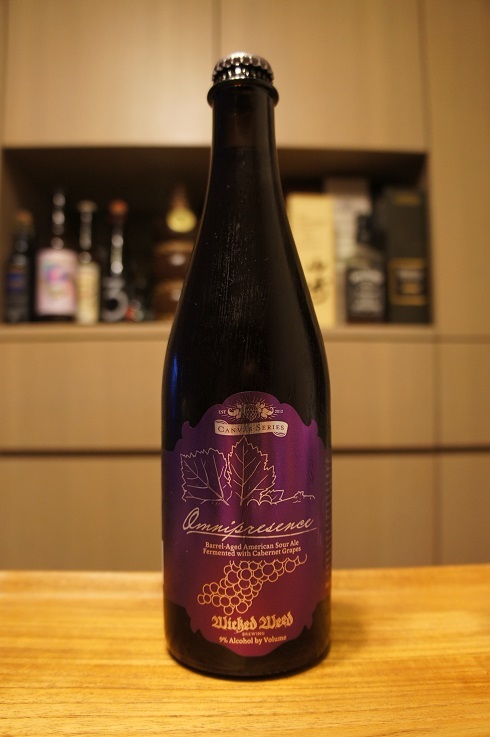 Overall: Nice good flavours of fruit, wine and barrel.